The great advantage of armor-as-damage-reduction is that it feels a lot more natural – and thus encourages role-playing. It means that your armor can help against environmental hazards that don’t roll to attack. After all, your friendly kitchen oven-mitt is armor, and it provides Damage Reduction (also known as Resistance) versus heat and cold, just as it helps protect you against the effects of dropping a pot on your fingers. Now it doesn’t provide very much protection – but once you admit that concept you can expect to see characters wrapping themselves in wet blankets before charging into the burning building to gain DR versus Fire, coating shields with asbestos before going off to fight that red dragon, and (quite reasonably) finding that their plate armor helps protect them when they push through that Wall of Thorns or leap through a Wall of Fire. Everyone knows how armor-as-damage-reduction works. Work gloves can help protect your hands from accidental cuts – but they’re rather less help against a direct blow with an axe or sledgehammer because work gloves only help so much. 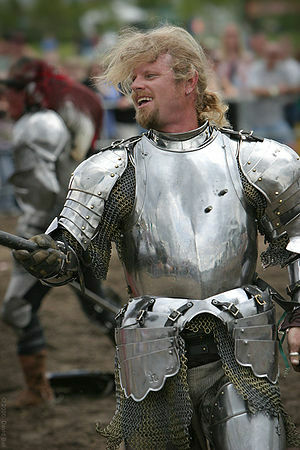 In fact, most forms of real-world armor also help protect against energy. Electricity and metal armor is the commonly-quoted exception, but we also know that conventional ideas about physics are irrelevant in d20 – where a Wall of Iron stops Lightning Bolts dead. They don’t go through, and they don’t have any effect on anyone on the other side – even if they’re leaning on said wall. The great disadvantage – at least from the player’s point of view – is that it means that armor loses effectiveness at higher levels. High-level opponents often do a lot of damage in a single shot. That DR4 armor looks REALLY good at lower levels, where a lot of things do 1d6 damage. When you’re up against something that does 4d8+4 damage, reducing it’s 50% chance to hit to 30% is a great deal better. That is, in fact, quite reasonable. Think about a car. Cars are complicated things, but when it comes to protecting you from outside dangers they’re basically a loose-fitting layer of metal around your body. Get hit by a pebble, or hurled rock, or something similar, and it will often bounce off – inflicting no damage at all to the operator and very little to the car. Hit something gently and the structure crumples a bit, and absorb a lot of the energy that would otherwise go into doing things like breaking your bones. Hit harder, and you can smash yourself against the inside of your own “armor”. Seat belts were added to help ensure that even more energy was used up in crumpling the metal before it got to you. Even more sophisticated cars add reactive padding – otherwise known as “air bags”. Hit too hard, and your “armor” becomes a twisted lump of metal*, with your mangled, impaled, body inside. At that point, you might well be better off being thrown clear and taking your chances on hitting some bushes or a big puddle of water. “If you hit the armor, reduce the damage by the armor’s absorption factor (versus slashing, piercing, or impact, as specified) and split the remainder between damage to the armor and damage to the wearer. If the hit is on an unarmored location, the wearer takes full damage” – followed, of course by a huge table or armor types-versus-locations. In actual play, I’ve found that this particular system is usually a bigger headache than it’s worth and still fails to account for the fact that you can beat someone to death right through a piece of chainmail without appreciably damaging the chainmail. Reality is just too complicated to model easily. When that colossal giant swings it’s three-ton maul at you, your plate armor should wind up looking more like a penny that’s been run over by a train. You chainmail should wind up as wads of metal driven into your flesh. Physical armor may help protect you from a glancing blow – one that, in D&D terms, rolled very poorly for damage – but it will also slow you up and make you easier to hit. Overall, it may not be much of a benefit at all, although it’s kind of hard to test that directly since the supply of real people in medieval armor fighting mace-wielding giants is rather limited. Does this change the balance of the game? Yes, yes it does. It means that – at the simplest – armor becomes more effective at low levels (Advantage: Fighters and armor-users) and less effective at high ones (Advantage; Monks, Wizards, and other unarmored types). No, No it’s not. Every game master and player changes the “balance”* of the game. Melee Martin, the game master who prefers fighters and never lets his game get past level five or six, may be quite delighted with armor as damage reduction. It will encourage the game he wants. Magician Murphy, who thinks the game isn’t worth starting without ten levels of wizard may be equally pleased, and for exactly the opposite reason; as the opponents get stronger, the system will discourage fighters. They’re both right; in each case, this particular rule change will help make the game work the way they want it to. If you want a game featuring more high-level fighters and paladins, or fewer low-level arcane spellcasters, armor as damage reduction is probably not the rule for you. *Balance: A magic word often invoked to justify nonsensical rules. See also: Realism (a magic word often invoked to justify burdensome or unworkable rules), Exception (a magic word invoked to cover up the inability to write a good general rule), Rules-Lite (a magic phrase invoked in order to avoid writing most of the rules in the first place), and Jargon (a collection of code-phrases used in particular fields in order to magically appear professional). External Physical Armor (and ONLY external physical armor) offers Damage Reduction that applies against both physical and energy based attacks equal to the armor class bonus it normally provides. This stacks with natural DR, such as a barbarian has, and is doubled against sneak attacks. Magical bonuses to armor class – regardless of whether or not they’re in armor – continue to add to the users armor class normally. External, damage reduction is not as effective as natural damage reduction. It will not reduce the damage from a successful attack below one point – two points for bludgeoning weapons and attacks – and can be bypassed on a natural 20, in lieu of rolling for a normal critical hit. Weapons which inflict piercing damage bypass two points of damage reduction. Shields are awkward, because they tend to provide a lot of DR if you block an attack with them, and very little if you miss. Here, of course, it’s time for an acceptable level of abstraction; Shields add to DR just like armor, at +1 DR per +1 to AC they would normally provide. If the game master wishes to bother to classify natural weapons as either piercing or crushing, that is up to him or her. Most of them will be Slashing anyway. The trick here is that you don’t have to provide complete realism to make things quite a bit more realistic than the usual d20 high-order abstraction, so a relatively small number of rules additions – in this case, those six lines – can help you out. Whether or not those additional rules, and the ensuing changes in the “balance” of the game, are worthwhile is up to you. This is a selection of the important rules bits from an article that is becoming quite a bit longer than the simple reply I was trying to write. When an attack is made, the attacker compares his attack to first the defender’s touch AC. If the attack is greater, the attack has achieved a partial hit. It makes contact and may or may not be a clean hit that bypasses armor and shield based DR. If it is equal or less the attack has missed. Next, it is compared to AC determined by adding in any shield bonuses to touch AC. If it is between this number and touch AC it has hit the shield and is subject to the shield’s DR as well as any from armor and natural armor. If it is greater, the shield’s DR is ignored. This is repeated for the touch + shield+armor bonuses and touch + shield + armor + natural armor bonuses. Each layer that is surpassed removes the appropriate DR from the damage calculation until all are removed at the clean hit level of the traditional AC. I might not ever finish this thing to the point where I will post it, but that is the basics without reasoning or many examples.